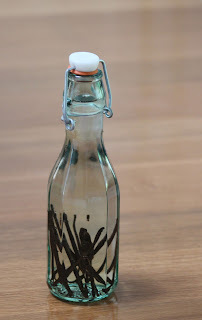 I decided I'd try my hand at making vanilla extract today. I understand the homemade stuff is far superior to most that you can buy, so I'm giving it a try. It's easy enough to make. You just need alcohol and vanilla beans. Take 250 ml of alcohol - I used an inexpensive vodka. Split 3 vanilla beans lengthwise and then in half and add them to the vodka in a sealable bottle. Put in a dark place like a cupboard for 2 - 3 months. Shake occasionally. 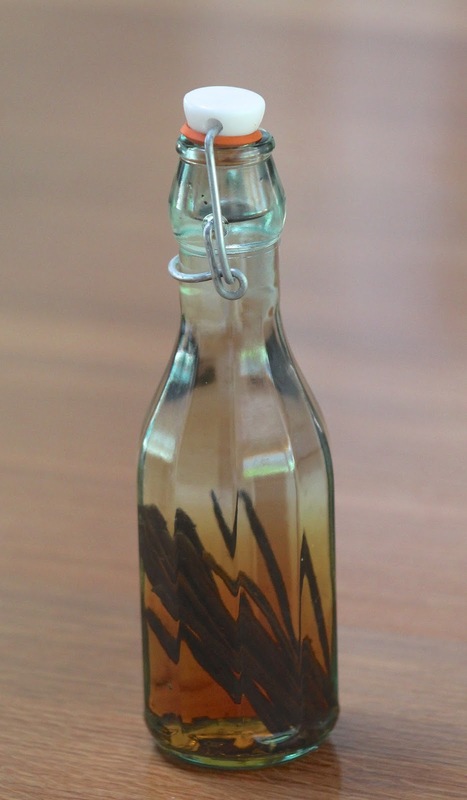 After 3 months, decant out a small amount and use as you would bought vanilla extract and top up the rest with fresh vodka. You can keep your original stock going quite a while. So mine is in the cupboard. I hope I remember in October. I shall put it in my diary!